To view our current inventory of high quality antique swords, and weapons of the US and other navies, click here! Presented is an Georgian Period King George III, (1738-1820) very rare Horse Head officer's short sword which measures 28 1/4 inches overall, and has a slightly curved 23 1/2 inch blade. The wide single fuller, from the ricasso to the tip is 23 inches long by 1 inch wide. The 3/8 inch spine is faintly engraved Solingen. At one time, the dark brown to black blade may have been finished in niter blue with gold wash, of which some remnants remain at the edge of both ricassos. The obverse blade is engraved with a royal crown over a large "GR" surrounded on either side by floral decorations. The reverse blade near the center carries the Royal Crest of the United Kingdom appearing to be the pattern of 1714-1800 surrounded on either side by floral decorations. 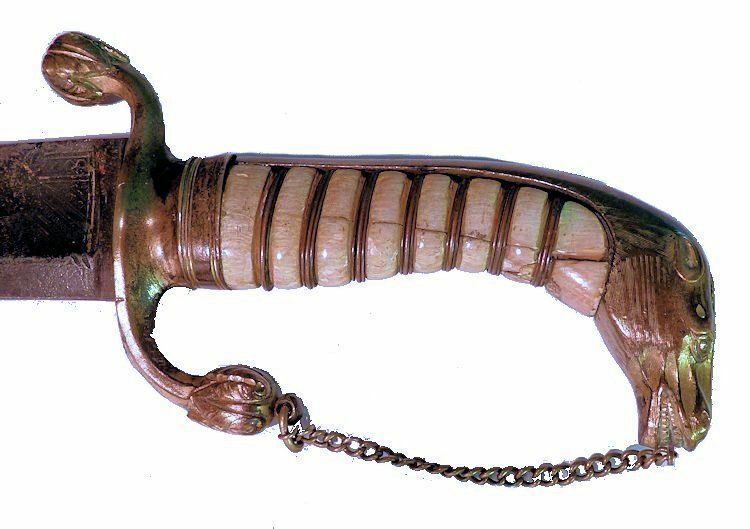 The magnificent Horse Head pommel has a full back strap with the horse's main extending from the carefully chiseled horse head to the cross guard. The beautiful workmanship appears to be of French creation. The hilt is tight with the blade. The cross guard quillions are tipped with floral caps and a chain knuckle guard. The bleached bone grip is wrapped with seven turns of a tightly wound single wire made in the form of a tight spring. Much of the gold wash remains on the hilt. 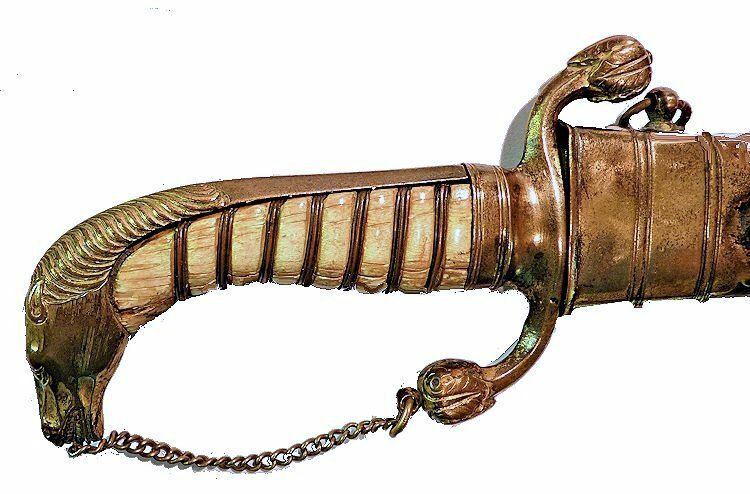 It would be an understatement to ignore that the hilt is a magnificent and important antique weapon. If only we knew its story. The black leather is in remarkable condition with all stitching tight and present and little scuffing or degradation. 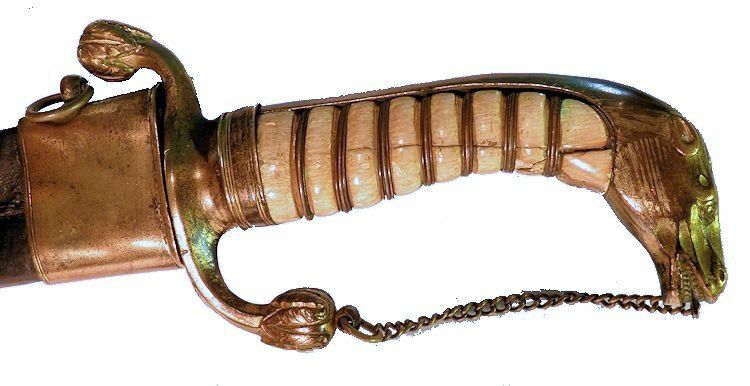 The throat and tip fittings are copper which at one time may have been gilded. There is a single carrying ring on the throat band as well as a throg. 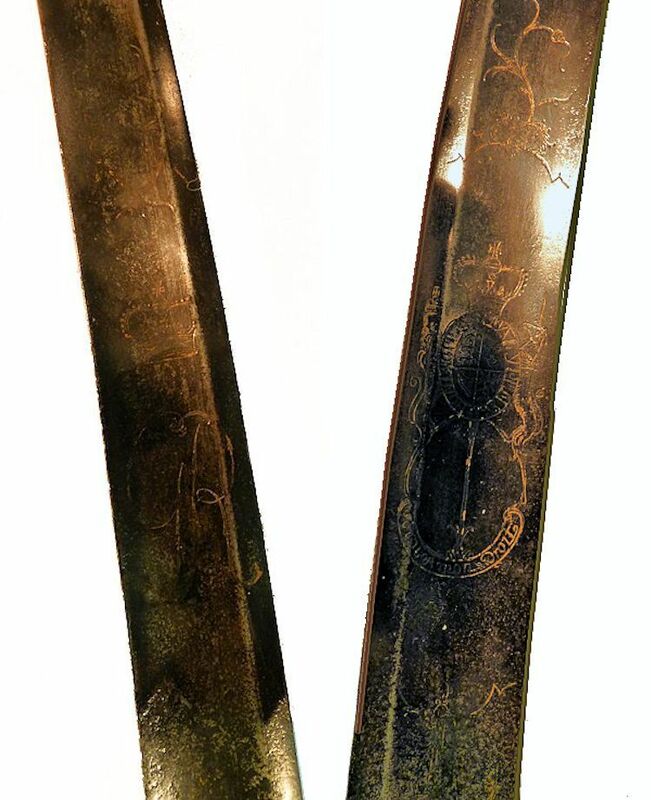 MARKINGS: Reverse blade engraved with GR under a royal crown with floral designs surrounding. Obverse blade carries the British Royal Crest of the United Kingdom Ca 1714 - 1800. The spine is lightly marked Solingen. There are no markings on the scabbard's copper work. SCABBARD & BLADE CONDITION: In addition to what has been described elsewhere, the blade and hilt are tight. The blade has turned dark brown to black with age with various small nicks along the cutting edge. The wide fuller carries all the way to the point which is common to many English short swords of the 18th Century. The scabbard is surprisingly good condition with little loss and all tight stitching present. There is a throg to attach to a belt. DIMENSIONS: Cutlass 28 1/4" long overall. 23" blade length Max width of blade 1"
OUR UNCONDITIONAL NO NONSENSE GUARANTEE: If not completely satisfied with your purchase it may be returned, if without damage, within five days of receipt in its original packaging. Return items must be insured for their full value. Only a prior email authorization by us for the return is required. Shipping charges within the continental United States are included with this offer if the error is due to our fault.